I’ve been working from home for more than 3 years now and after all this time, I think what I miss most about the normal workplace is the commute! Yes, what people typically hate the most is the one thing that I miss. It’s not so much the stuck-in-traffic or the TTC delays though, rather it’s the free mental time that you have; and this only happens because you’re stuck in a process with no way to go faster. That gives you time to think about stuff other than what is happening in front of you. I don’t get the same luxury anymore because when you work from home, there’s always something to do. It might be something you have to do, or it could be stuff you want to do. That same down time just doesn’t exist when you’re at home. Vegging in front of the TV isn’t the same because your brain is focused on what’s happening on the tube. In fact, it’s most similar to taking a shower (where a lot of great ideas are also thought up), and it’s something which a commute is great for. That’s what I miss the most. Last July when I flew Porter to NYC for work, I had to stay an extra night in NJ because my departing flight was delayed for too long due to thunderstorms (and the early curfew at YTZ). Out of that trip I ended up with $150 in vouchers/credits which were expiring soon. So I used them on my most recent trip down for work (although somehow, only the $50 voucher worked). Coincidentally, on the day I was going to depart NYC, I received an email saying that my 20:10 flight had been cancelled, again due to weather (thunderstorms/lightning) and that I had been moved to a flight on the next day. I didn’t really want to do that because Jovian is still pretty young and I wanted to get home. So I looked at my options for changing my flight. Through Porter’s web portal, I wasn’t able to change to the 19:30 flight so I tried to call into their call centre to try my luck. It turned out that that flight had been cancelled too! The agent suggested that I try and switch to the flight before that, departing at 18:15. That was way to early for me because I couldn’t get to the airport by then! But then he told me that that flight was already more than an hour delayed (this was around noon). Meanwhile I had looked at other options. I could book a flight out of another airport for around the same time. But in the end, I figured that if there was a weather delay affecting EWR, it would affect JFK or LGA as well. So I might as well try my luck with Porter (at least the 18:15 flight had a known delay). I went back onto the web portal to change my flight and…the web portal didn’t let me (always showed an error). So I called into the call center again. After another 30 min wait, I was able to change onto that flight. And I thought all was good! A little bit later in the afternoon, I checked my flights again and found out that the 18:15 flight had been delayed to past 10PM! I knew this was bad because it was luckly that that flight wouldn’t fly into YTZ due to curfew. I looked at the flight before that, scheduled for 16:00 and it was delayed until 20:35! I could definitely make it to the airport before then so I switched to that one. I was kind of worried that the flight would leave earlier than expected though (does that ever happen)? In the end, I made the right choice. That flight left “on time”, after the 4h35m delay and I was able to make it home that night. The 18:15 flight ended up being completely cancelled and a co-worker who was flying out of another airport to upstate NY ended up staying an extra night. Finally, I want to call out a bit of laziness. This is hard to swallow, but the people who will get their dream jobs are already doing their dream jobs before they get hired. You wanna be an accountant? Start doing your friends’ taxes. You wanna work in an ad agency? Make spec ads for your friends’ and family’s small businesses. Wanna be a journalist? Start making YouTube videos. Mechanic? Fix some cars. Teacher? Tutor poor kids. Yeah, you gotta make money. So sling coffee. And be darn well passionate about it. Find a coffee shop you love and pitch yourself to them, so you can make a few bucks an hour to support your weekends of doing your dream job for free. That’s how economies work. People do things. Real things in the real world with grease and sweat and moving parts and grit. Your credentials are theory. Familiarize yourself with the concept “necessary but not sufficient.” The suit does not make the (wo)man. A lot of people attribute my class cohort’s success to the coop program at Waterloo. That may or may not be true; but for me, I know I have been doing what I do in my day job since I was an teenager. Ever since I have had an access to a computer, I wanted to build and create stuff – whether it’s webpages, or games. Building mobile apps and getting paid for it is just a way to support what I enjoyed doing as a kid. You may not always be able to end up supporting yourself by doing something you enjoy, but if you start early and build up skills & experience around it, you are more likely to get there. I’d say that March split itself into two parts – the first part, during the first two weeks of the month was when I was wrapping up things at my old job. There wasn’t too much to do then as we weren’t in the middle of a crunch time, so I spent the first week finishing up the work that I was doing, and the second week doing a lot of knowledge transfer and the usual good bye things. Immediately the next Monday (Sunday actually), I flew down to NYC and started with my new team down there. We have a temporary office at WeWork until our own location has completed its build, and this temporary location is actually pretty nice. There are lots of (smallish) offices with no real walls – everything is glass. But the desk are a nice contemporary wood – kind of what you would find at Crate & Barrel. It was also around this time that things started to get warm(er). The temperature hovered around 0°C and I was actually able to walk around NYC a bit after work hours (didn’t get a chance to catch any shows though). Through the last week things started feeling like Spring, and the snow is almost all gone here in Toronto! Good Friday/Easter came early this year, right at the end of March. Unfortunately for me, Good Friday is not a statutory holiday in the US so I worked through it – although now that I work from home, it’s not too bad. 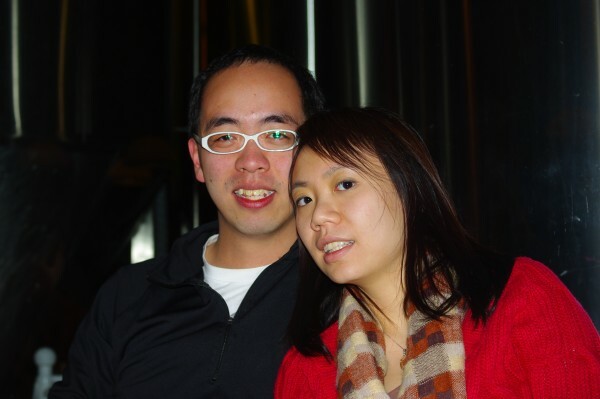 We did end up going to Buffalo on the Easter Saturday (yet another trip to the US) though. I quit my last job a bit over a year ago and I did it again last week with tomorrow being the last day of work for me. Compared to IBM, I was only at Echoworx for a little over a year, but I felt it was time to move on because a unique opportunity found me – getting to work at a new division that Samsung started, the Samsung Accelerator. The opportunity sounds interesting as it is a startup atmosphere looking to build new products that leverage Samsung’s hardware stack. I start right away (i.e., on Monday) so there’s no break for me to catch my breath. I’m excited because I get to build some new products from scratch; but also because it’s in NYC so I’ll have to go down there every once in awhile! In the building that I work in now, there are a series of super confusing elevators. There are three different pairs of elevators and they all terminate at different floors or sections of the building; depending if you want to go outside, to the second floor or the mall. Usually parking is below the pedestrian floors but in this case they are above. So P3 and P4 make sense as they are the third and fourth floors, until you see P2 which is actually below the first floor. Unsurprisingly many people get confused and go up from P3/4. 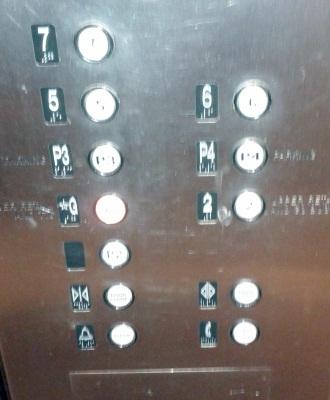 If that is not confusing enough, the P2 button actually only works on one of the two elevators (because only one elevator extends down to that floor). If you didn’t know any better, you would just think its broken. Before I quit my old job, I gave my old laptop backpack back because it was all broken (Targus bags apparently do not last – it became all frayed from being brought to work in a car for a few years…). I didn’t know what would happen after I started at my new job, would I get a new bag? Would I even need to carry a laptop to-and-from work. Well the answer is no to both, and really all I needed to bring to work was my lunch (I don’t even need an umbrella due to my short commute). For the first few weeks, I had been using my MEC backpack, but it’s felt a bit odd because I don’t have much to fill it with and it feels like I am travelling with tags and a compass dangling from the back. So I started shopping around for a bag for work. I didn’t want to get an all leather bag because it just feels too serious at this point – it’s not like I am working at a bank or firm. I ended up deciding on this Fred Perry bag. 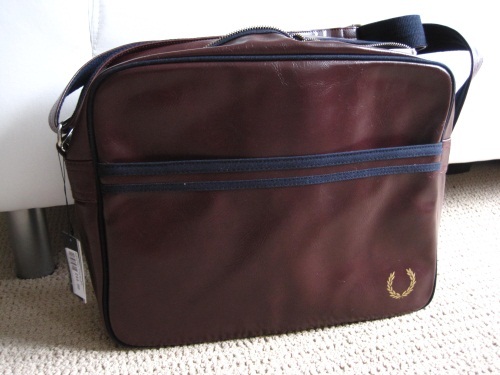 Luckily for me, when I was looking for a bag, Fred Perry was having a sale so the price went down from £45 to £22.5. Unfortunately it would cost £12 for shipping and I may be hit by the 17% duty and HST which would end up setting me back about $100 for the bag! Instead, I started looking for options and happened to find the same bag on Ebay. I ended up buying it there – it was a bit more expensive (about the same after shipping) but at least I didn’t have to pay customs or duty on it! In the even nearer past (i.e., while YRT has been on its 80+ day strike), I would take the Finch bus from the stop outside my house, and then transfer at Warden up into York Region. Coming home from work, I would get off at the TTC stop across from my house and didn’t need to walk from Finch station. In practice, this ended up taking longer than taking the VIVA+walking because I had to wait for the inconsistent schedule of the 68B and I couldn’t take any express Finch buses since I had to get off at an intermediate stop. Now, my commute is much shorter, I just need to take the local Finch bus to the station and subway for a few stops. Because I have to transfer every 5 minutes or so, and the frequency of the local buses have been pretty good so far (perhaps they are optimized for this direction instead of my previous opposite direction); my commmute is actually too short! I can’t sleep on my commute anymore or have enough down time to read a book or listen to music – I haven’t even been using my iPod on the commute! No more draconian security policies – I can forget to lock my computer and (gasp!) leave paper sitting on my desk overnight! Lunch on the company every Friday! Now that I have a subway job, I have to decide whether I should use tokens every day or buy weekly/Metro passes. Sure passes are more flexible and convenient, but I don’t really take the TTC that often aside from going to/from work. Plus, passes are quite expensive in Toronto. Right now, a token costs $2.60 each while a Metropass costs $126 per month*. I also have the option of getting a weekly pass when I can predict heavy TTC usage; but a TTC is a clear rip off. At $37.50 a week, it works out to $162.50 a month ($153.12 with three weeks off)! So the calculation comes down to whether I should use tokens or buy a (normal) Metropass. What’s the number of trips per month where the costs start breaking even? At full price, it would take 48.5 trips before you break even – or about 24 days of work. However, you can now get a 15% tax credit for each pass which is a $18.90 savings each month bringing the effective cost of each pass down to $107.10. At that price, you need to take 41 trips or about 20 days of work to break even**. In January, because I was on vacation in the first week, I won’t make it to 20 days and have been using tokens. This year’s February is a bit weird and I will make it to 20 days so I’ll buy a Metropass that month. I think I will consider Metropass purchases on a month-by-month basis now! * I don’t think it’s worthwhile for me to subscribe to the annual Metropass since there are some months, when I take vacation, where I might take 10 or 20 fewer TTC trips than average. ** The same calculation for a Metropass subscription is 19 days, so a subscription doesn’t offer much advantage from a cost perspective. After almost exactly five years as a full-time employee at IBM, I quit my job this week! I started in the first week of January 2007, and stopped working on the last week of December 2011, so it’s very close. There is a funny retention statistic in IBM that < 50% of employees have been there more than five years, I guess I didn't want to be part of the sub-50% group! I'm moving on to another company working on other things, maybe I will blog more about it later. The whole process seemed like it happened fast, but also seemed to happen slow. I found out about the new opportunity in the beginning of December and did whirlwind research, application, interview and received an offer. Then I was in a bit of a lull for a week, while waiting for offers/counteroffers/paperwork; but once everything worked out I gave my notice and today was my last day! 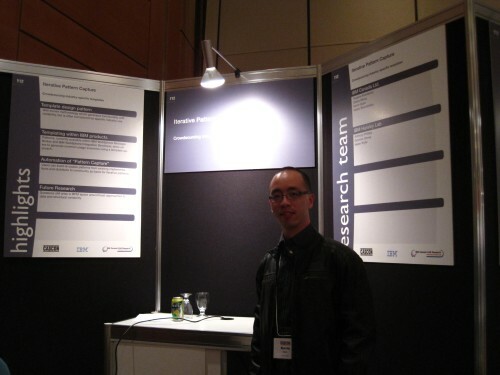 IBM has been a good experience for me, but it's time to try something new and hopefully it will work out even better. Every year in October, the employees at work spend a couple of weeks on a campaign called ECF (I think it stands for Employee Contribution Fund) where we contribute to various charities. The “closing ceremonies” (I think the Canadian GM said a few words, but not to everyone) was a family skate at the Air Canada Centre. I recall that they had it before, but this was the first time that we actually went. You pay $5 per person and you get to skate for about 45 minutes on the ice. For that price, you also get 2 slices of Pizza Pizza pizza and a drink, so it’s a pretty good deal! You also got entered into a draw for a Lenovo laptop, but I don’t know if that’s a one-time thing. Skating on the ACC ice surface is pretty exciting, because I see it all the time on the TV. 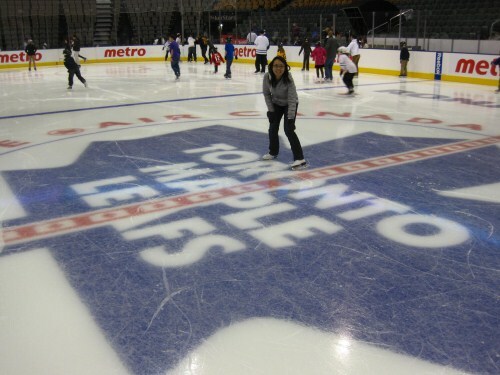 They had all the markings on the ice, including the Ford, RONA, and the centre ice logos. Strangely, they had repeating Metro (the grocery store) logo on the boards. I’ve seen an IBM ad on the boards during the game, so I was surprised that that wasn’t up; but maybe Metro paid to advertise during the open practice the next day (I did see the IBM ad on TV on Saturday night). What is even more neat is that you can go around the benches and penalty box. I was even able to pretend I’m Glenn Healy and stand between the benches! There’s actually no glass (except behind me) so you can hear both benches (and you have to be paying attention to the game in case the puck, sticks, or players come flying at you. 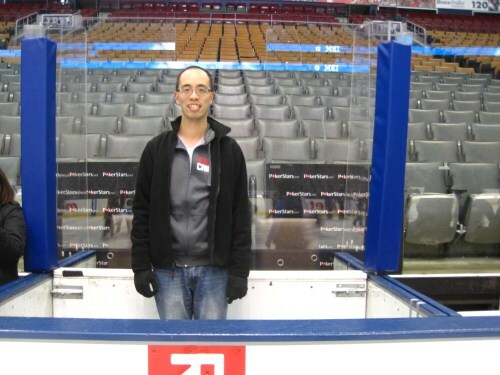 There was actually a guy (working for ACC I suppose) whose job it was to make sure the penalty box doors were closed. You could go in (and of course lots of people did for fun and to take photos), but you had to make sure to slam it shut, which he made sure you knew or did for you. I guess he had to be hired for liability reasons. We had exclusive use of the ACC for our corporate event, and there were only so many of us, so they had a very skeleton staff. We were able to walk around a lot of the areas, so after we finished skating we went to explore a bit. 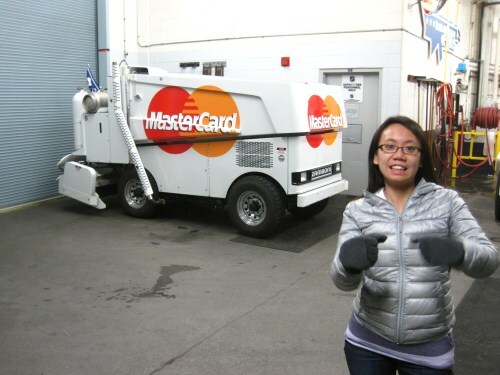 We saw where they stored the Zambonis and saw some other NHL-specific rooms (well only their doors since we couldn’t get in). We were also able to walk around underneath the Platinum seats, and saw all the rooms where all the people sitting in the Platinums go for food and drinks between periods! 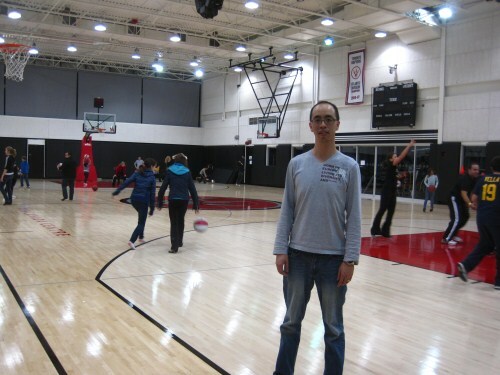 The Raptors’ practice court was also open to us and we went in to take a look. They had the court open the entire night, so I guess you could have just shot some hoops instead of skating. I’m not a big basketball fan so this was not as interesting to me, but they had a gym (you can see the windows of the gym) and also framed versions of all their jerseys. Overall, I would say this was a really good deal to be able to go to these places, skate, and receive food/drink for only $5! 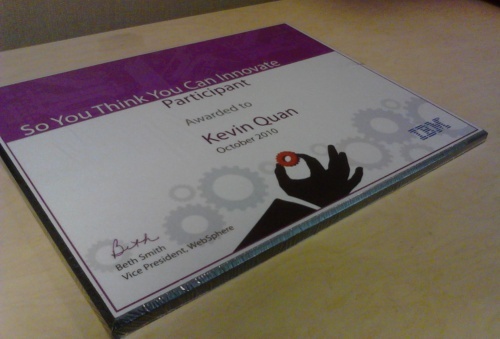 In the summer, I participated in an ongoing extra-curricular activity at work called So You Think You Can Innovate? where teams of people around the world tried to come up with interesting ideas. We didn’t end up winning, which explains this “certificate of participation”. What I find funny about the whole thing is that this is a quite glorified certificate. Usually they just send you a PDF which you can print out. For this event, they sent an “award” plaque that I can hang on my cubicle wall. Maybe I’ll save my wall space for better things. CASCON happened this week, from November 1st to the 4th. This year, I had an exhibit in the technology showcase. It’s been a couple of years since I participated in CASCON as a presenter. Things haven’t changed much though, it’s an ACM recognized conference, but there isn’t a lot of foot traffic or interest in the technology showcase. It’s only the papers that matter. Now that I’ve moved, my work hours have changed. Instead of getting in at 9AM, now I typically get in before 8, usually around 7:45 or so, but could be even 7:30 depending on which VIVA I catch. That’s pretty early, especially if you take into account that we have flex hours so a lot of people don’t come in until 10! That gives me a lot of quiet time to get my work done, and then I leave earlier than usual which is also a plus. It actually works pretty well once you get past the guilt of leaving before everyone else, and getting up earlier. I was checking up my personal history at work this week, when I noticed that a patent application I had filed way back in August 2007 had its state changed to GRANTED. Wait, what did that mean? I did some more checking and found out that my patent application is now a true bonafide patent (in the US), US patent #7,761,415. Time to rip off that patent pending sticker. I started working on writing an article in February. It only took a day to write, and has been in review and edit cycles for a long time, but it’s finally published now! I’m not sure how they pick the featured article, but it is currently the featured article on the site. Writing the article was a lot like writing a research paper. There are a bunch of names, but the junior people do the majority of the work. Oh well, at least it’s another Google hit for my name. The World Cup has started. Yay? or who cares I guess because I’m not a soccer football fan. I don’t care for waking up early to watch games, or hanging a flag from the car, or continuing my hockey-habit of watching CBC. The World Cup is so big that even work is kind of endorsing it! Work is streaming the games off their servers so you can watch it on your computer while you work. How is that possible? they’re basically expecting that people watch football for half the day! I also heard that the World Cup is the largest sporting event in the world. My first reaction was no way – it can’t beat the Olympics. But then I guess it could be true. The Olympics don’t really appeal to countries who aren’t participating (such as Caribbean countries in the Winter Olympics, Norway in the Summer Olympics, or Africa in either). Whereas, the World Cup has participants from every continent. January is the start of hibernation, but there were some significant events. The biggest news story was a 7.0 earthquake very near the capital of Haiti which decimated the country. Haiti is very poor to begin with and this is the anvil that broke the camel’s back. NOLA was poor so the situation was bad, but at least they were part of USA. This is an entire country that collapsed. There was a lot of death, from the earthquake and the aftermath. A lot of fundraising was performed and donated but it doesn’t seem like the country can just pick itself up and rebuild. The second big news story was Google doing battle with China. After Google discovering that unauthorized access to some GMail accounts were part of a larger, systematic attack from somewhere in China; Google threatened to stop doing business in China unless they were allowed to stopped filtering the Internet. The US government stepped in to say a few words, but didn’t make any meaningful action, and then eventually the news died down. Actually I don’t know what the result is, maybe Google is going to pull out. This month I also decided to map out the restaurants participating in Winterlicious on a Google Map. What started out as a little project ended up garnering more attention that I thought (I also got linked from Sweetspot which I had never heard of before)! Less exciting things were that I got my review for last year at work, we had a nice balmy week of above 0°C temperatures, and that was about it. On to February, and another month of hibernation! This year there were no big life events, at least none that could compare with getting married. But that is good because that means life was smooth, and can be enjoyed without having things nagging in the back of your mind or as many responsibilities to think about. Although because there are few peaks and troughs, I get the worry that I am sleepwalking through life. I think what contributes to this is work and the processes around it. There is a lot of repetition from Monday to Friday, and then the work itself is not too interesting. Sure, there are challenges/difficulties, and I’m being placed in different scenarios; but nothing is insurmountable nor a genuine shift in paradigm. There is a general ennui although I don’t know if it its because of IBM or what I should expect after the honeymoon period of working. But to be fair, I can’t say it was entirely boring. I did grow my career with more responsibilities this year; I was leading a team (although am not a people manager yet) and had some lackeys to do the work I didn’t feel enthusiastic about doing (yay for students!). 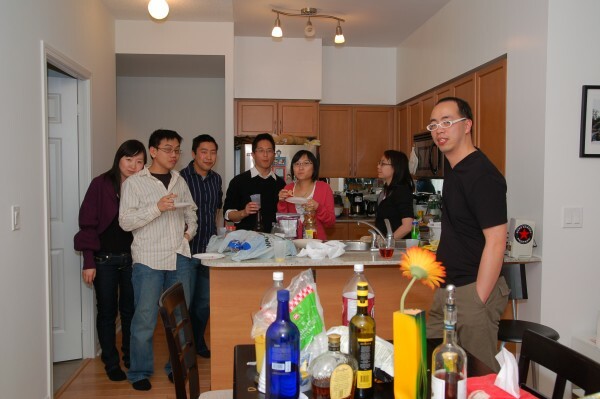 The weekends were usually filled with parties/social gatherings, or family activities. In the summer there was the added load of festivals, short trips or weddings. One change this year was that we didn’t go downtown that much; every time we go it feels like an event since we don’t have convenient access to the subway anymore. That cut down on the TSO, CD crawls, etc. We continued to travel this year, as we are trying to make the most of our opportunities before nesting. 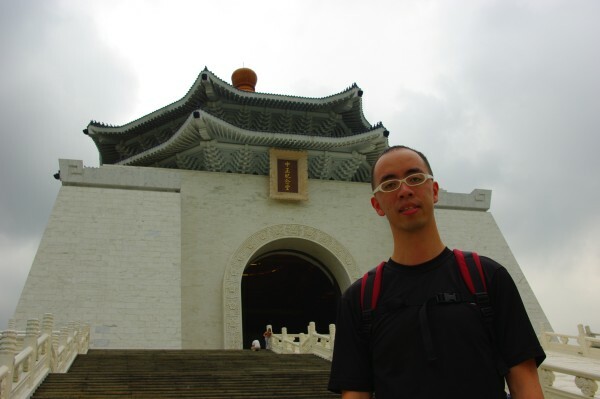 We went to Asia for our long(er) summer holiday for the second year in a row, it was not originally planned that way but because ended up there because of family considerations. I’m starting to get a bit tired of travelling, mostly because there is such a concentrated need to travel and make the most of it within a short period (i.e., 3 weeks every year); plus the places we go to and see are not that conceptually different from Toronto. 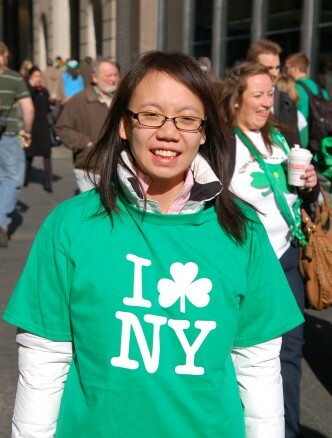 We did experience a couple of neat things though, one was being in NYC during St Patrick’s Day where they had the largest St Patrick’s Day parade in the world (although not that interesting once you’re there). 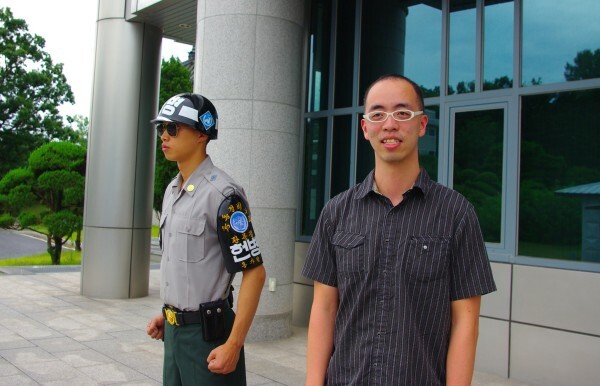 The other was going to North Korea, although it was on a guided tour and we weren’t allowed to deviate and explore. climbed the CN tower for charity. Only went to the TSO once, the movie theatre 3 times and only bought 17 CDs! What did I do this October. That seems to be a good question for myself every month and these recap posts have become more and more useless. Well Fall is here. The leaves were turning colors and both the mornings and nights are dark (yeah the extended DST is useless – we end up turning our lights on in the morning and when we come home). We didn’t take any trips to see the fall colours, although I did take a walk through the East Don Parklands, but by then all the leaves that were going to change had already fallen down. The Google Wave hit, the MJ estate released their cash-grab movie and soundtrack, Obama won the Nobel Peace Prize, the hockey season started and for a long time it looked like the Leafs wouldn’t win a game in October. I went to two concerts, Kylie at the ACC and the TSO for the first time this season. I also had an exciting Xbox weekend where I ended up as part of the mob for 1 vs 100 and attended a Forza3 party/car show. Work has been uneventful except that I had the opportunity to do a couple of interviews for some students that may be coming next term. I interviewed four guys from Waterloo and one from UBC, although I was just participated and wasn’t leading the interview. I wonder if I’ll show up on InternSHARE‘s interview notes? It was interesting to be on the other side of the phone though. Surprisingly, it is just as stressful (or maybe because I haven’t had enough experience) being the interviewer as being the interviewee. I think that everyone at work has sufficient meetings that most can operate on a manager’s schedule, but I do find that I fall into the maker’s schedule trap sometimes. You know, at like 4PM in the afternoon when you don’t really want to start anything because by the time you get into a groove, you just have to go home anyways. The second article is about a set of skills that one should have and develop in this day and age. I can’t agree enough with this list; if I had thought through the same problem, I probably would have come up with the same points. I think it’s important to be above average or excellent in all of these skills, but the difficult is getting there since many of them are not things that you can actively practice. How much you get paid – most people work to earn a living, so this is something to consider ain’t it! How fun the job is to do – if you have a totally boring job, like say standing in front of Buckingham Palace, then the days are going to be really long. How fulfilling the job is – which is different than how fun the job is. You could be a general and order a bunch of people to their deaths, but it could be fulfilling since you’ve saved your country. How easy the job is – You can have a fun and fulfilling job, but it might be the hardest thing in the world. Like designing a NASA rocket. For everyone, it comes down to some linear combination of these four factors. But I suspect young (Chinese?) people are invariably influenced by their parents to put pay and fulfillment (which sometimes translates into status) above all else.